Looking for a pair of skis or bindings? Need to update your ski jacket? Looking for someone to go skiing or snowboarding with? Browse our classifieds. Have anything skiing related to sell? An apartment to rent? Post a Classified Ad. 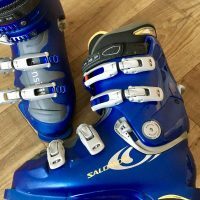 Men's Salomon Evolution 2 8.0 Ski Boots - NOW SOLD!